Cellvizio® is the ﬁrst and only probe-based Confocal Laser Endomicroscopy (pCLE) solution on the market. It is compatible with most ﬂexible videoendoscopes, which makes it possible to observe gastrointestinal and lung tissues at the cellular level during standard endoscopy procedures. Cellvizio® enables physicians to obtain relevant diagnostic information on mucosal lesions in real time and treat the patient immediately. Cellvizio® is also being used following therapeutic procedures to ensure that physicians removed all potentially dangerous tissue from the patient. Why is real time cellular (microscopic) information relevant ? Cancer is a disease of cells. 90% of cancers grow in our body’s mocusae, starting below the surface and then expanding up and down. A diagnosis of early cancer can only be made under a microscope. Until now, this information was only available after a biopsy had taken place and the results analyzed. Cellvizio® provides images of individual cells and tissue architecture, allowing the endoscopist to adapt patient management based on the nature of the tissue, in realtime, in vivo. What is Cellvizio® currently used for? To help physicians determine whether the pancreatic or biliary ducts are closing as a result of a pre-cancerous or cancerous lesions. To help physicians more accurately target biopsies and treat patients when they’re monitoring Barrett’s esophagus, a potentially pre-cancerous condition that arises from advanced gastroesophageal reﬂux disease (GERD) or heartburn. To help physicians more accurately evaluate the nature of colorectal polyps and to ensure that all the precancerous tissue has been removed after a polypectomy. Physicians have been using Cellvizio® to image lung tissue from proximal airways down to alveoli in patients presenting pulmonary lesions. targeting and conﬁrming that the area of interest for histological sampling is reached, and/or visualizing immediately abnormal tissues. 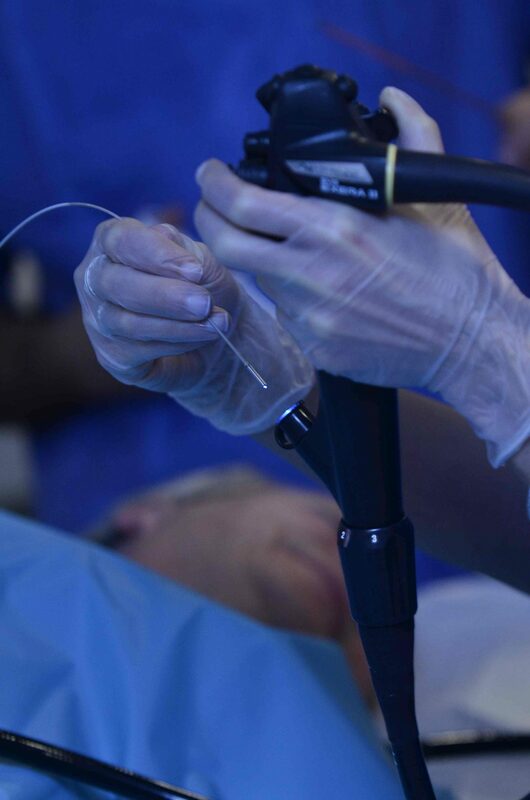 Cellvizio® may assist in the follow-up of patients with bladder lesions following TURBT (Trans-Urethral Resection of Bladder Tumor), in the characterization and mapping of bladder lesions during rigid cytoscopy, and in order to distinguish between normal and abnormal urothelium. What are the benefits of Cellvizio® for patients? Fewer procedures (all-in-one procedure: diagnosis & therapy). Immediate results (no wait time for pathology). Why is Cellvizio® a major advance in cancer diagnosis and treatment? For decades, physicians have removed suspicious tissue from the body and sent it to a lab for analysis. However, current imaging modalities cannot reveal microscopic details in the tissue, leaving physicians no choice but to take blind or random biopsies. These procedures often lead to diagnostic errors. At last, thanks to Cellvizio®, physicians can use real time microscopic information to characterize tissue while it’s still inside the body, thus allowing a much more precise procedure and diagnosis.